Ross White; guitar, vocals and most importantly, logistics. I make sure the band turns up at the gig! I currently live in Liverpool and work as a mechanical engineering. Playing in Gleadhraich gives me lots of opportunities to travel and explore other countries and places with the band. I have travelled across the UK and Europe and the east coast of the USA and played lots of amazing gigs in the process. In my spare time I like cooking, running and enjoying the great outdoors. Paul Weir (22) is the drummer/ banter producer in the band. 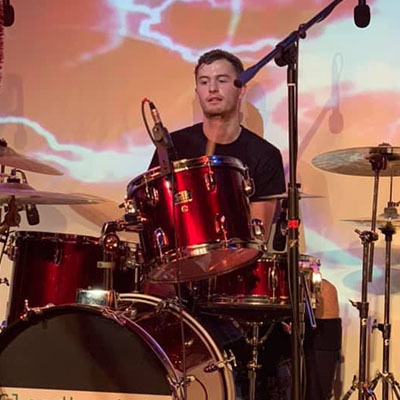 Paul has been playing drums since the age of 7 where he began playing snare drum in the Arbroath pipe band, where he went on to be leading drummer for 8 years. At the age of 10, Paul got his first drum kit, where he had tuition from Luva Anna, AMWWF and Sinderins drummer Billy Fisher. He is not only the best drummer in the band but the best musician also, according to fans. Paul is also a part time member of Craig Weir & the Cabalistic Cavalry. Saying: Vous pouvez seulement pisser avec le coq que vous avez. Fun Fact: German for bagpipes is Doodlesack. As the band’s fair weather player, you can find me at the more glamorous, further afield gigs. I was originally lured in with the offer of a trip to New York/USA in 2018. Which I did not turn down! I think I’ve passed my probation period now, pending Craig’s acceptance.I took the job of chief second fiddle player after failing the audition to be Paul’s left drumstick. I occasionally play some bass guitar too. When I’m not prancing around with the band I work as a Cloud Architect (a fancy title for a kind of software developer) in London. Ewan makes up part of the horn section of the “accordihorns”. No, you are not seeing double, Kerr (making up the “accordi” part) is his identical twin brother. Ewan started playing keyboard aged 9, went on to study saxophone at high school and dabbled a little in the flute. 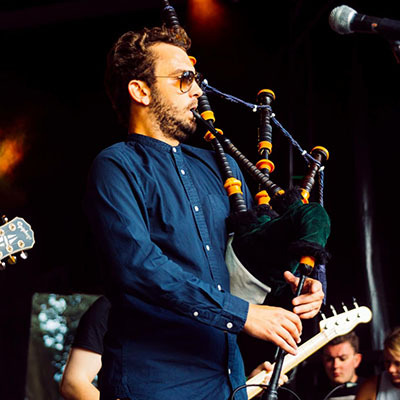 Ewan has played in various bands and groups including blues, rock, swing, jazz, funk, Scottish, and folk. Ewan also enjoys playing piano for local amateur dramatic societies as well as occasionally taking up the baton to direct a band pit or two! 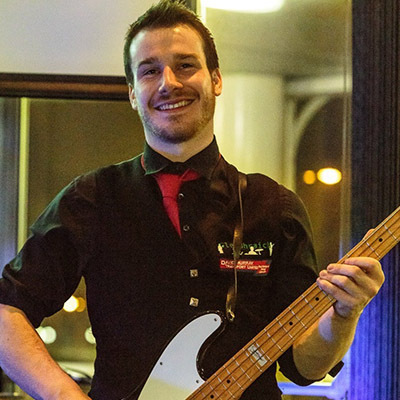 Ewan works as a doctor when not performing and so enjoys his time in the band and travelling with the Gleadhraich family to relax and play high energy, feet stamping, feel good music. Kerr is the ‘Accordi’ of the ‘Accordihorns’ and brings a bit of tradition with his accordion to the band. 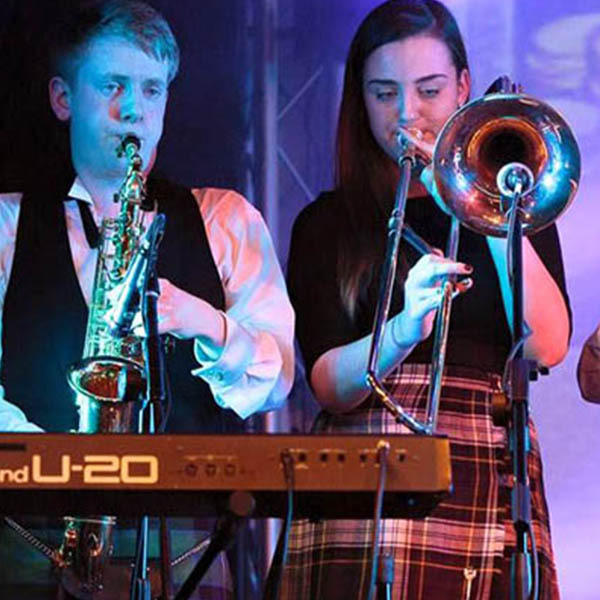 Kerr has been playing the accordion since the age of 10 and since then has picked up the piano and percussion to perform in all sorts of music groups from ceilidh bands to symphony orchestras and from musical theatre pit bands to brass ensembles. 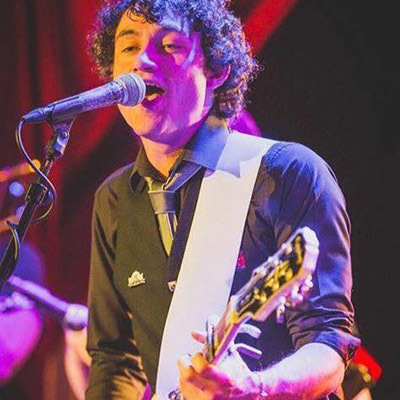 When he is not behind the microphone, Kerr can be found in the classroom teaching Geography and Environmental Science, although he does like to bring a bit of music to his lessons when he can! Born under the oppressive thumb of the Russian state, David’s first experience of music was listening to bootleg cassette tapes of Shania Twain. In a bid to catch her attention as a precocious 6 year old, David learned the violin, before being inspired by virtuosos such as Stephane Grapelli and Cotton Eyed Joe. Alas, this came to no avail other than an automated reply to her official fan phone line after leaving a message with a violin reggae remix of “You’re still the one”. After escaping Russia by walking east through the frozen wastes where he entertained himself by learning the saxophone , David ventured to Scotland via Shania’s native land to pursue an academic career only to immediately drop this when called up to the illustrious ‘gleadhraich accordihorns’ as this would give him a legitimate reason to wear a kilt as a non-scotsman. He hasn’t looked back since…..